Erebus is set in a small British town called Wakely. The economy of the whole town seems to rely on the local farming industry and in many ways Wakely could be said to be self sufficient. The butchers butcher and sell the meat of local livestock bought from the local cattle market. The bakers use flour that has been made from locally grown corn and I am sure that if there were a candlestick maker in Wakely his candlesticks would be made from locally mined metal. There isn’t a candlestick maker in Wakely though. Nor are there any metal deposits in the land. But Wakely has a bigger problem than just a distinct lack of candlesticks. And it is a big enough problem to test the metal of any butcher, baker or candlestick maker. Or anyone else for that matter. Things are changing in the town. The livestock is growing bigger and faster than normal and is growing vicious. Mares are eating their foals. Suckling piglets are ripping their mother open and foragaing in her guts with their bloody little snouts. A Freisan heiffar gives birth to a grosely mutated calf, that rips its way through her stomach wall to arrive in the world covered in a mess of blood and intestines. If strange things are happening with the local livestock though, stranger things are happening to the townspeople. Their skin is turning white and starting to peel off in big flakes, and their teeth and fingernails are getting longer and sharper than they used to be. Some people are even growning hairs on the palms of their hands. And all of this is just for starters! The good people of Wakely are turning bad, turning of each other and turning on anyone else that crosses their paths. The central characters in Erebus are a Farmer called Vic Tyler and a reporter called Jo Ward. Vic grew up on one of the local farms, but moved away first to go to college and then to a lucrative carreer in the City. Vic’s father has recently died though, and so now Vic is back in Wakely and plans to take over the running of the family farm. Jo is an American, but shehad to flee her homeland after putting her life in danger by spilling the beans about the New York mafia. Now she works for the Arkham Comet. It’s a little paper in a nice low-key town. There might not be bright City lights, but neither are there a lot of flying bullets. I guess you could say that she has moved to Arkham for health reasons. When a scientist from a Wakely chemical plant rings Jo late one night, sounding scared and desperate for a meeting with her, she agrees to meet him in a lay-by. The scientist fails to turn up for their late-night rendevous though, and Jo’s subsequent investigations reveal that he has disappeared. Sensing that a big story could be about to break, Jo books a hotel room and tries to find out the truth about the scientist’s dissapperance. It doesn’t take long before Jo and Vic join forces and, working together, they try to get to the bottom of what is happening in the town. They make a good team and, as you might expect, romance is in the air for the farmer and the American. 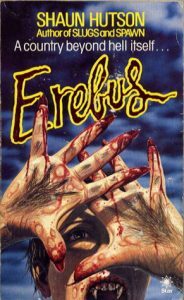 Erebus is quite an unusual story, but as you might have gathered, it is a little bloody and gory in places. So if a story with gory is not your preferred bedtime reading then I would give this one a miss. If the thought of little piggies going to market and turning mommy pig into assorted offal does not offend, then you should be okay with the book. I was okay with it. Nothing turns my stomach or offends me and I found Erebus rather an enjoyable read. Vic and Joe are both interesting characters and I enjoyed watching their relationship develop as, all around them skin was bubbling and peeling and blood was spurting and spewing. So, in summary, Erebus: what can I say? It’s a good read, but be aware that the characters get to show their guts in more ways than one (along with all the other bits that are best kept covered up).